Twenty-seven year old Rabi Biswas is a unique artist who has made it his life`s mission to document and uphold a folk art form that is traditionally a woman`s domain - the alpona. Belonging to a farming family, Rabi`s story is exceptional. Born in the village of Aurobindonagar in Nadia district, Rabi used to be interested in drawing from a very young age. To encourage him, his father hired an art teacher from a neighbouring village, who was also well versed in folk arts. By the time he was 12 or 13 years old, he was encouraged to learn alpona making from his maternal grandmother, Sumitra Mondal. However it was only two years later, that he decided to study the art of alponas from nearby villages. 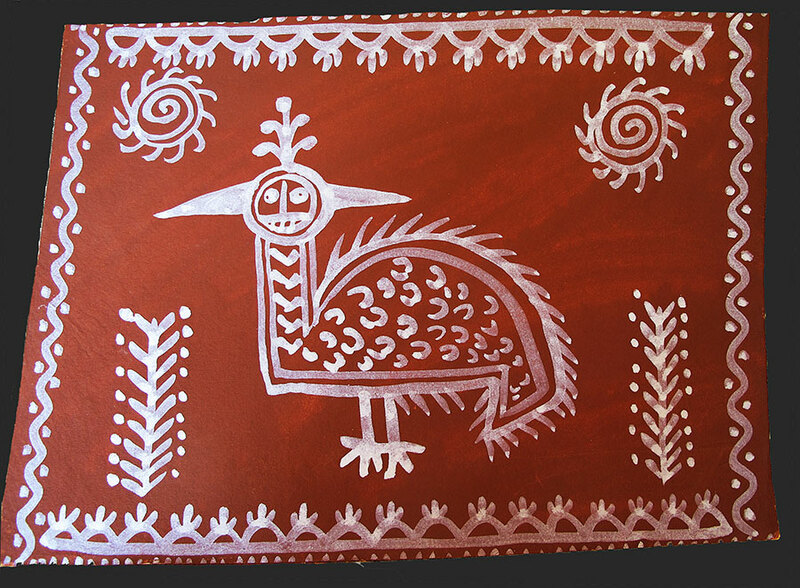 His first attempt at alpona was the drawing of an owl, which he proudly brought back to his grandmother. It was then that she took him under her wing and started to teach him how to create alponas. Rabi was a meticulous student and took detailed notes on how to create a wide range of alponas, what rice to use and so on. Pretty soon, Rabi Biswas began to witness a strange phenomenon in his village. The women were spending less time with rural rituals - brotos and alponas - and preferred to be watching soaps on cable TV instead or earning money by cutting betel nuts. Therefore come festival or ritual time, they prefer to hand over charge of alpona making to their brothers. 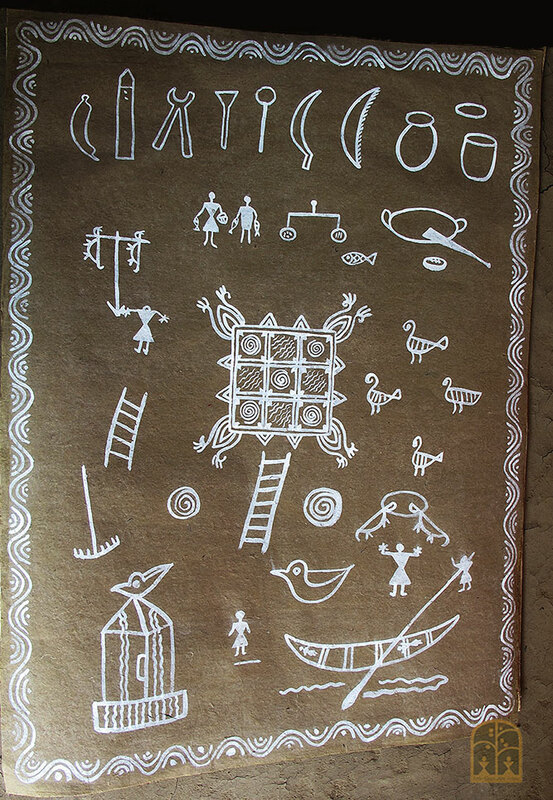 Before long, he found that he was willy nilly being made the keeper of the alpona art form by the women in the village. A few other young men in his village have also been inspired by him. 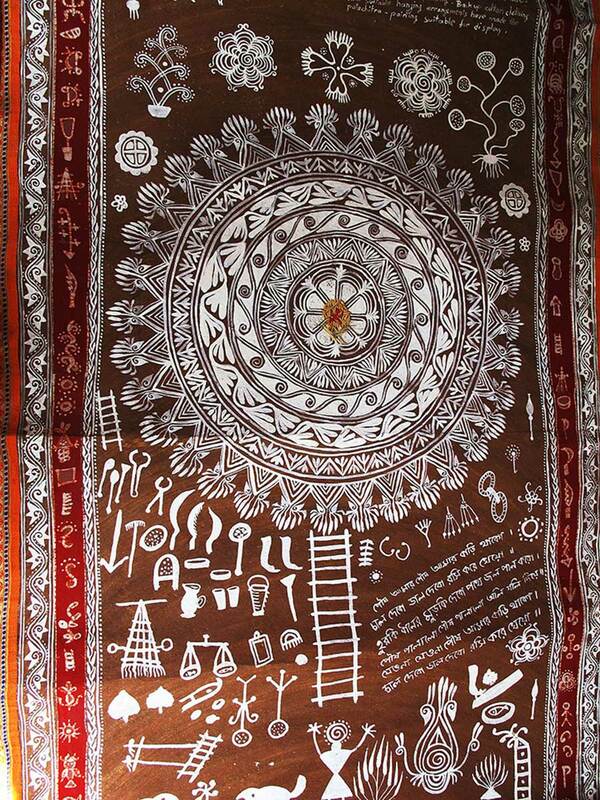 This is possibly the only village in West Bengal where the art of alpona is being preserved by the men. 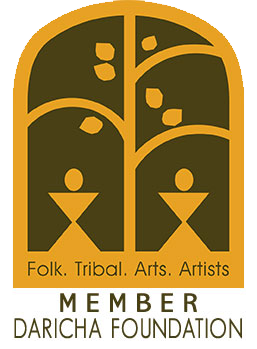 Of course the brotos or rituals (or what is left of them) that accompany the alpona, continue to be the woman`s domain. 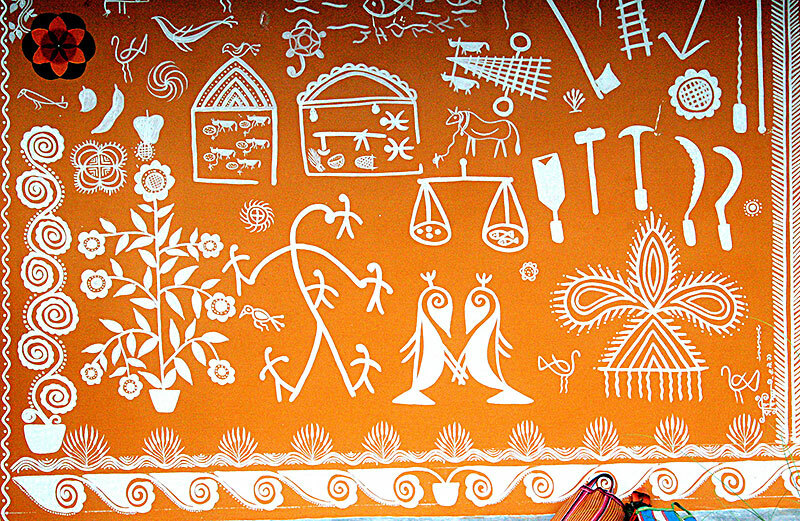 In 2007, the West Bengal government was looking for an alpona artist for an exhibition in Delhi. But strangely, no rural woman could be identified. It was then that someone recommended Rabi. Excited at this opportunity, he asked his grandma to teach him more and thus began his journey. 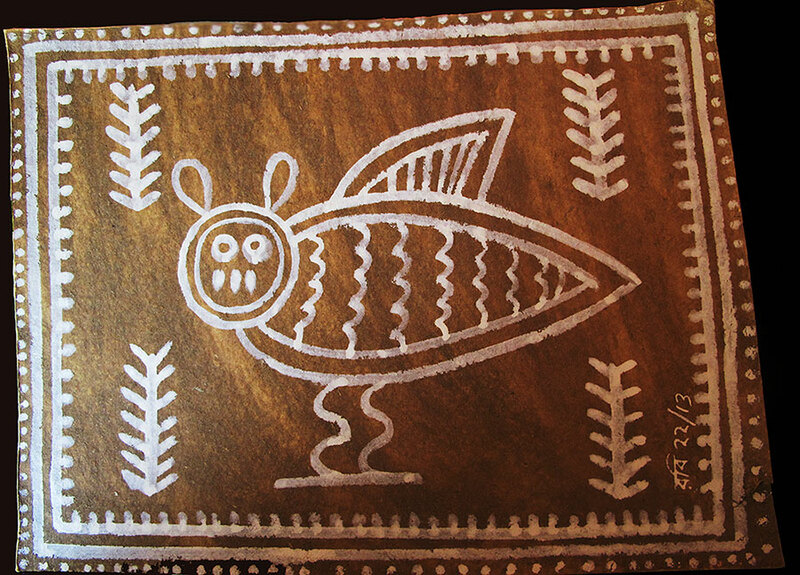 Registered as a folk artist, he was invited to display all his alponas at the exhibition. It was at this exhibition that a gentleman from Kolkata gifted him with a book on Brotos of Bengal , so impressed was he with the young artist. The book was an eye opener for young Rabi who was only in class XI at this time. He started frequenting local libraries and eventually found his way to the Rabindra Bharati University library at Kolkata and discovered an early edition of Abanindranath Tagore`s book on alponas of East Bengal (not the Visva Bharati publication). He found to his delight that he could identify similarities with what his grandmother had taught him and began to delve even further. He shared his discovery with Bangiya Sahitya Parishad, a literary society of repute, who suggested that he should start documenting alponas for a book they would publish! Though only just out of school, Rabi had collected alponas for about 40 different brotos. Recognizing his passion and his talent, he was given enormous support by academicians and government officials who paved the way for his membership of numerous libraries across the state, even though his lack of educational qualifications would not normally have permitted this. His book, Lakshmir Paa was eventually published by Charchapada in January 2014. 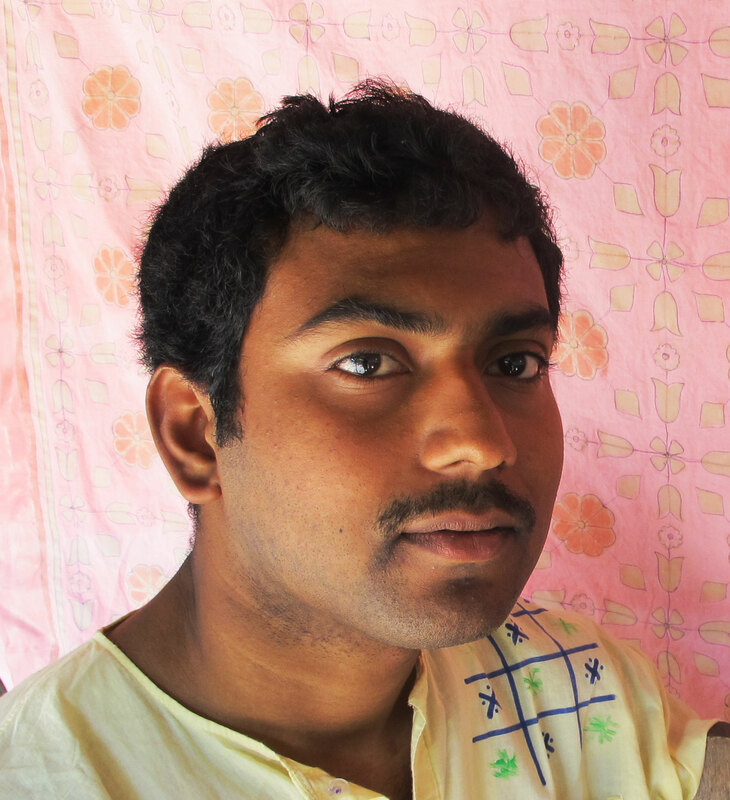 Rabi won a scholarship to study at Kala Bhavan, Visva Bharati University, Shantiniketan. He has since graduated and continues to research and practise his art. He bemoans the fact that in most villages, rice powder has given way to khari mati which is sticky - then zinc oxide - now maida and some adhesive - and finally stickers. he uses either rice powder or khari mati (white clay) and gum extracted from the bael fruit. 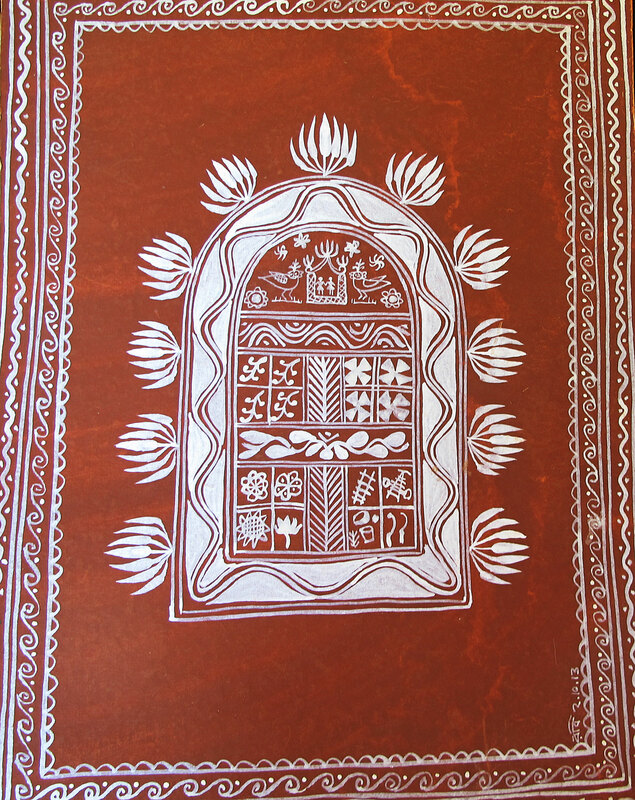 Rabi processes handmade paper or canvas with layers of cow dung and clay to give the effect of rural soil. He sells his alponas at fairs 3 or 4 times a year and uses the money to fund his studies. Since 2007, he has also participated at various fairs and exhibitions of repute, including the famous Surajkund Crafts Mela, an annual fair celebrated in Faridabad District, Haryana, and the Crafts Council of West Bengal exhibition at the ICCR, Kolkata. His work has been bought by the Peerless Inn hotel group, and displayed at their restaurant, Aheli. For the Bangiya Sahitya Parishad museum, he created alponas on cloth which were then stitched together to form a false ceiling. He has also had exhibitions at Howrah and Hooghly districts.